There are many meditation chimes (bells) out there. So many in fact, that it can be a challenge to know which to choose. In all honesty, you’ll probably end up with a collection, from which some will become your favorites and others may well be consigned to gathering dust. If you’re in the market for a (or some) new mediation chimes, check out this awesome list. 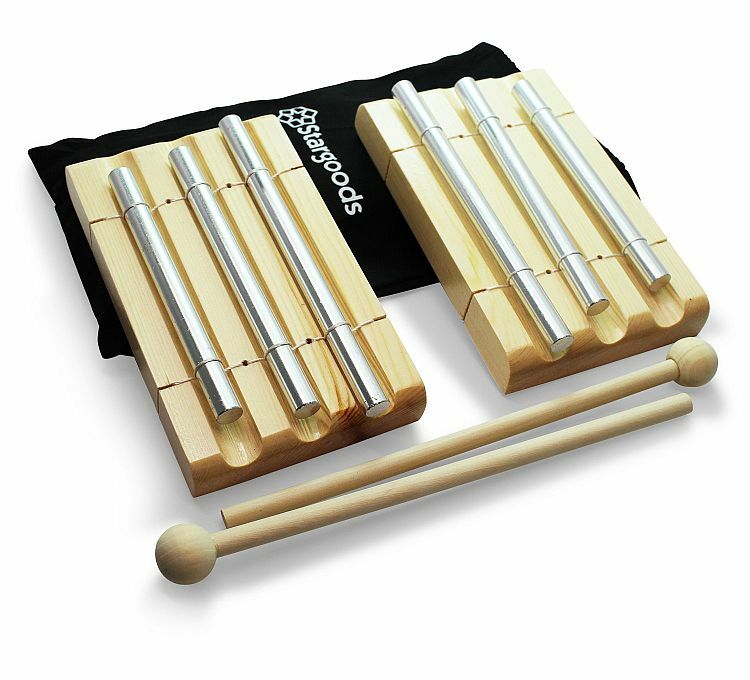 The Woodstock Solo Silver Zenergy Chime is a great choice for a single tone chime. And we particularly like the backstory behind Woodstock Chimes, the producer. It was nearly four decades ago when instrument designer and musician, Garry Kvistad, made his first chime. He created it from an aluminum chair that was destined for landfill. In 1979, he and his wife, Diane, founded Woodstock Chimes. And to the day they still develop and produce the chimes sold by the company. With its cherry finish, ash wood base, and silver solid rod, not only is the sound beautiful, it’s aesthetically pleasing as well. Another single chime, the USA made TRE40 Meditation Energy Chime emits a beautiful tone and is pretty neat to look at. This baby is made to last, plus it has a handy hanging cord for placing it exactly where you want it during meditation. Actually, the cord is a truly important part of the chime, because anything that touches the bar influences the sound. With TreeWorks chimes, the cord is made from carefully selected fibers. In addition it’s cleverly located so the bars never touch the mantle, and the knot is tucked inside the mantle hole so it can’t impede the sound in any way, shape, or form. One tap, and the stunning sound released will soothe you into your time of solace and contemplation. A great choice, and one that’ll last a lifetime. The Meditation Om Tingsha Chime is a cymbal bell that’s actually produced in Nepal by Tibetan artisans. When the cymbals are struck together the chime will last for between 15 to 60 seconds, depending on the amount of pressure used. The tone is delightful, and can be as soft or as loud as you like, you simply have to vary the force of the strike. Buying a Mudra Crafts product also gives you a 30-day money back guarantee – something this very first importer of Tingsha chimes into the USA is proud to state. The sound resonates with incredible clarity, and depending on the force you strike them with, can be gentle and soothing or can pierce the air. A great value choice for such a quality item. Offering a truly pleasing sound to the ear, the Stargoods Energy Chime 3-Tone not only sounds good, but it looks pretty cool as well. With its natural colored wooden base and three silver polished metal tubes, this is the perfect start to any meditation session. The chimes produce a long, clear ‘ping’ when struck, and as there are three to choose from, if you wish you can strike more than one to benefit from the opposing sounds that travel through the air. Many people like such a sound, finding it quite hypnotic and a great way to begin the meditation process of clearing your mind. Handmade in Nepal, this Tibetan Bell and Dorje Set is made from brass and is 5” in height. To use, you strike the bell with the Dorje to produce a bright bells sound. Alternatively, you can stroke the bell around the rim with a wooden stick to make a singing sound. Thanks to being handmade (a real tradition in bells of this type), there are always little imperfections in the crafting. This is something to be thankful for, because it makes the sound of every bell unique. In fact, such imperfections can make the sound produced appear almost a little off-key, but this is part of their charm. This is definitely the type of meditation charm favored by traditionalists.